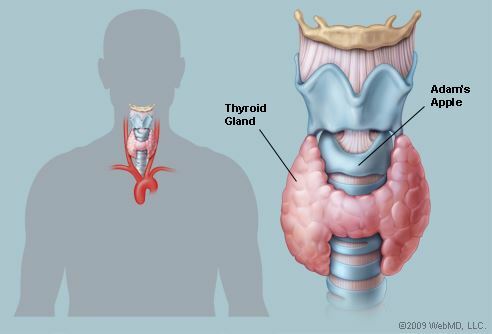 The Thyroid Gland is a soft, small bow-shaped gland, located in the front of the neck, below the voice box or larynx (Adam’s Apple) on either side of the trachea (windpipe). The healthy Thyroid Gland uses ingested iodine from iodine enriched foods to produce thyroid hormone which regulates body and brain growth and development, body temperature, energy levels and metabolic functions. (the rate at which the body produces and uses energy from nutrients and oxygen). Thyroid hormones influence and regulate the activity of all cells and tissues in the body. The thyroid gland is part of the endocrine system and produces the hormones thyroxine (T4) and triiodothyronine (T3). The Thyroid Gland is controlled by the hypothalamus and pituitary gland at the base of the brain. TSH (thyroid stimulating hormone), which is secreted by the pituitary gland, travels through the blood to stimulate the production of thyroxine and to a lesser extent small amounts of triiodothyronine from the thyroid gland. T4 is essentially a prohormone that gets converted in the tissues in the body that need thyroid hormone for normal function. T4 (thyroxine) controls your metabolism. If there is not enough T4, your body will slow and become hypothyroid. If you have too much T4, your body will speed up and become hyperthyroid. As T4 has an influence over every cell in your body and gives your body energy, you will notice changes, if your thyroid function changes. T4 also controls growth of the brain in the foetus and linear grown (height) in children. If the thyroid gland produces insufficient thyroid hormone, this is known as Hypothyroidism, or an underactive thyroid, which causes the body’s metabolic functions to slow down, resulting in many different adverse effects on bodily functions. If the thyroid gland produces too much thyroid hormone, this is known as Hyperthyroidism, or an overactive thyroid, which causes the body’s metabolic functions to speed up causing adverse effects opposite to hypothyroidism. This is also often called thyrotoxicosis. The most recent research in Australia has shown that around 14% of older Australians suffer from a clinically relevant thyroid disorder with 4% having an undiagnosed thyroid disorder. National studies in 2004 have shown that approximately 50% of Australian children and a similar percentage of pregnant women suffer from iodine deficiency. More recent smaller studies have shown that approximately 10% of pregnant women in Australia suffer from mild hypothyroidism (subclinical) secondary to autoimmune thyroid disease. Thyroid cancer also appears to be on the increase, With 2014 thyroid cancer research showing the previous 10 years of thyroid cancer affecting an increase of 84% in women and 48% in men.